Fable is a handsome chocolate colored Lab mix boy, about 2 years old. He is always happy to meet people and his tail never stops wagging. I have seen him be a little snarky with other dogs, but it's most likely just frustration at being caged. HIS LAST DAY ALIVE WILL BE MARCH 7. For the life of me, I can't figure out why this big boy's name is Trouble. He came into the shelter wearing a harness that was too tight...so sounds like he was in trouble! He is about a year old and is a very serene sort of guy...very dignified. HIS LAST DAY ALIVE WILL BE JANUARY 29. This baby is about 9 months old. She closely resembles a Yellow Lab, but her nose is just toooo long! It gives her a very unique look, don't you think? She is a mellow, quiet kind of girl. HER LAST DAY ALIVE WILL BE JANUARY 29. Oh, what a face! Can't you just tell what a big clown this boy is from his picture? He is only about a year old, so he has many years ahead of him to make people laugh, if only given the chance. HIS LAST DAY ALIVE WILL BE JANUARY 29. 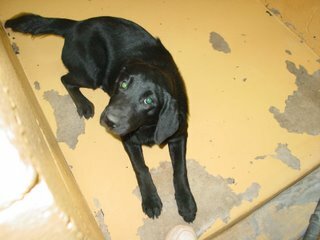 This little girl was surrendered to the shelter by her owners along with another puppy. The other puppy was rescued, and now this sweetheart faces death all alone. She is only about 6 months old and has been vaccinated and de-wormed thanks to a wonderful group of people who donate vaccines to the shelter volunteers. She is a typical puppy..active, friendly, affectionate. HER LAST DAY ALIVE WILL BE JANUARY 29. This sweet little girl is only about 35 lbs. She has the shiniest, soft black fur. You can see the sweetness in her eyes in this pic, can't you? At just a year old, she is much too young to have her life end here. HER LAST DAY ALIVE WILL BE JANUARY 29. This boy is pretty young, about 9 months old. When he has his ears up, he closely resembles a purebred GSD. 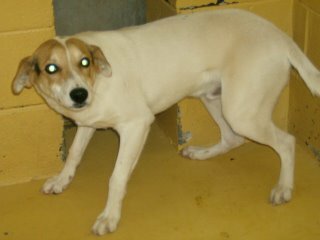 He is a very happy, outgoing boy who would love to have a family of his own. HIS LAST DAY ALIVE WILL BE JANUARY 29. This big fellow just sits in his kennel, shaking like a leaf. He seems so grateful for a kind word and a pat on the head. Can you restore his faith in humankind? HIS LAST DAY ALIVE WILL BE JANUARY 26. 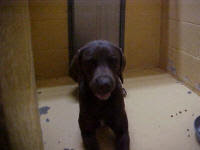 AO7-0106 CHOCOLATE LABRADOR RETRIEVER MIX-GENESIS-RE-CLAIMED BY OWNER!! Sweet Genesis' owner knows that she has wound up at animal control but has not come to get her and now her time is growing short. 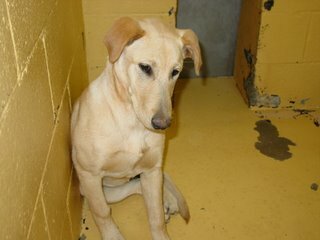 Genesis is a beautiful 1 year old girl who is UTD on her vaccinations and has a current rabies tag. She is a friendly, outgoing dog who needs a home where she will never be lost again. HER LAST DAY ALIVE WILL BE JANUARY 26. This little girl is about a year old and only weighs about 25 lbs. Her ears normally stand straight up, but she put them back for her picture. She is a sweet, sweet girl. HER LAST DAY ALIVE WILL BE JANUARY 26. AO7-0075 YELLOW LABRADOR RETRIEVER MIX-JASON-ADOPTED LOCALLY! YAAAAY! This little boy is super sweet! He is about half the size of a Labrador and only about a year old. He really is a sweetheart and would make a wonderful family pet. HIS LAST DAY ALIVE WILL BE JANUARY 20. Every time I pointed the camera at her, this girl would lay her ears down against her head...but her ears actually stand up naturally. She is not very big, about 40 lbs or so and is just about 9 months old. She is very social and really wants to get out of here. HER LAST DAY ALIVE WILL BE JANUARY 23. This boy may look imposing, but he is just a big puppy at about 9 months old. He has the bobtail of a Rottie with the body of a Shepherd. HIS LAST DAY ALIVE WILL BE JANUARY 23. 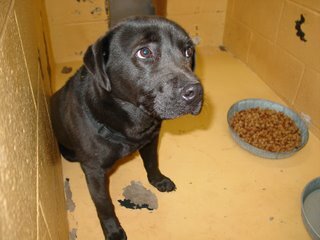 AO7-0093 CHOCOLATE LABRADOR RETRIEVER MIX-JULIUS-ADOPTED! 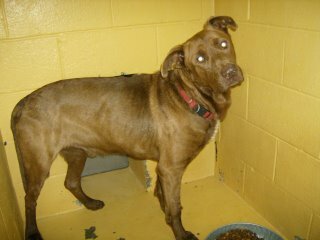 I wish I could have gotten a better pic of this boy...he is a very impressive-looking dog with his chocolate color and his green eyes. He is also very big, about 70 lbs. He showed up at someone's house and played great with the other dogs on the property and the small kids of the family were able to handle him with no problems. But he did chase the cat and the horses there...so would do better in a home with no cats or livestock, please. HIS LAST DAY ALIVE WILL BE JANUARY 24. 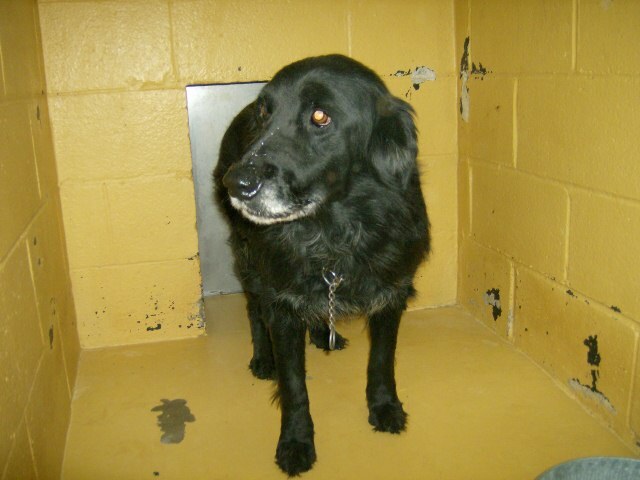 AO7-0098 FLAT COATED RETRIEVER MIX-JEANIE-RECLAIMED BY OWNER! YAAAAAY! Another senior girl here...she has a pretty feathery black coat that is turning gray..I'm guessing she is about 6-7 years old. 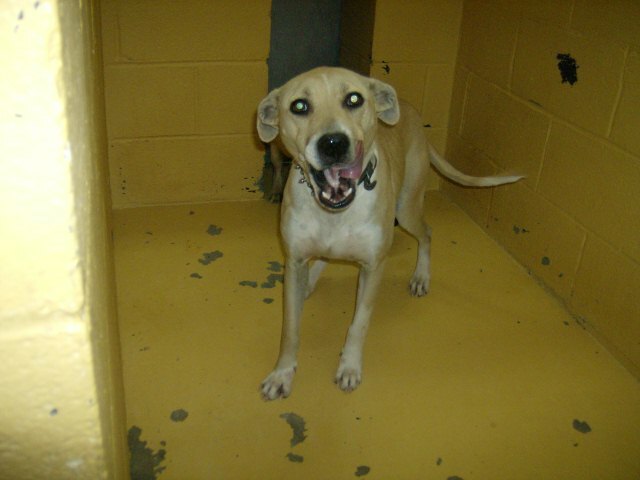 This girl is REALLY friendly, just stands in her cage, smiling and wagging her tail at you. HER LAST DAY ALIVE WILL BE JANUARY 24. AO7-0091 BLACK LABRADOR RETRIEVER MIX-JUNE-RESCUED!! This girl is about 6-7 years old...and this is nowhere to spend her golden years! She is a friendly, outgoing girl who deserves better than to end her life here. HER LAST DAY ALIVE WILL BE JANUARY 24. This little girl is actually bigger than her photo looks. She is about 9 months old and is a sweet, loving baby who is blissfully unaware of the danger she is in. HER LAST DAY ALIVE WILL BE JANUARY 24. 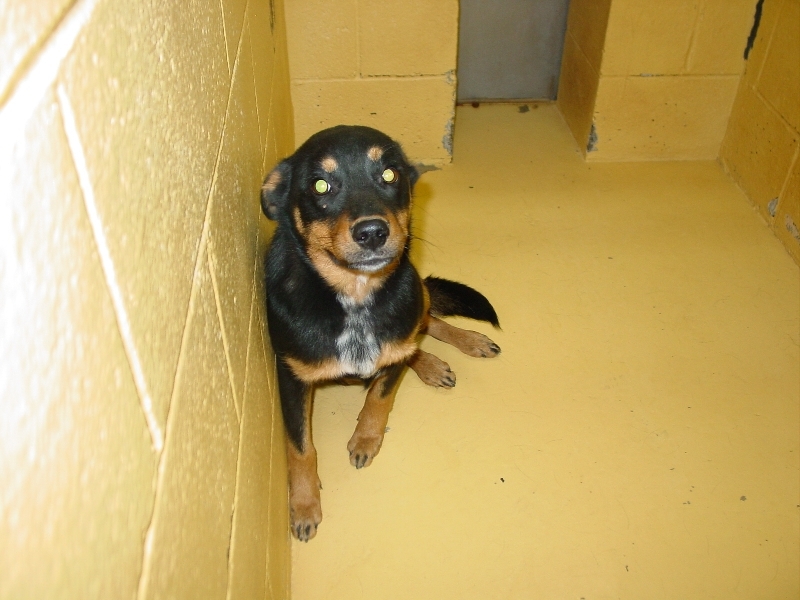 BO7-024 AUSTRALIAN SHEPHERD MIX-OWNER SURRENDER-RESCUED!! WONDERFUL!! Well, stories don't come much sadder than this one. This boy is 16 YEARS OLD and has a terrible cough. 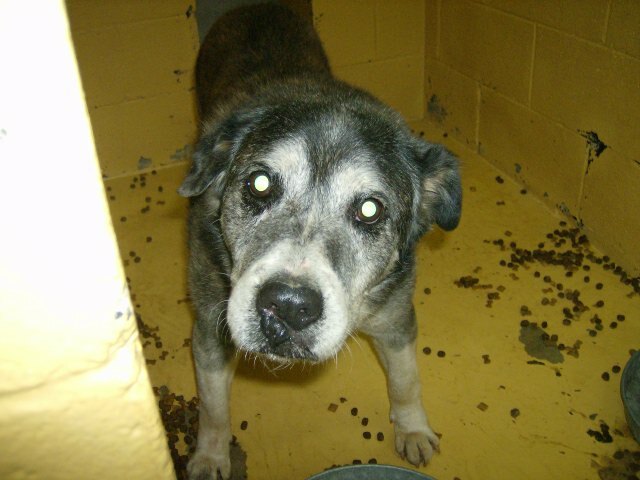 His owner stated that she had him since he was a pup, but did not have money for a vet visit, so decided to leave the poor old thing at the shelter..maybe she thought someone else would see him and be willing to help him. He is a real doll and deserves to live out what time he has left in warmth and comfort...can you help him? HIS LAST DAY ALIVE WILL BE JANUARY 25. This big boy was caught in a trap and brought into the shelter today. 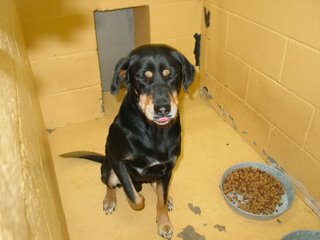 He appears to be a purebred Rottie about 2-3 years old. He was very nervous today, but seemed grateful for some attention. HIS LAST DAY ALIVE WILL BE JANUARY 25. You can just tell by the look on this boy's face that he wishes he was anywhere else but here. Can't you open up your heart and save him from this place? HIS LAST DAY ALIVE WILL BE JANUARY 9. This boy is a Shepherd mix who is about 2 years old. He has such an expressive face and the biggest brown eyes that will just melt your heart. HIS LAST DAY ALIVE WILL BE JANUARY 9. 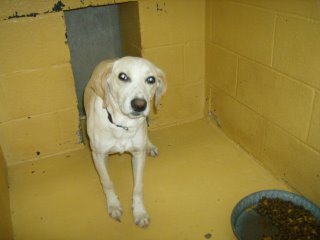 This sweet little girl is absolutely too cute to be in this dreadful place! Could she be any more adorable? 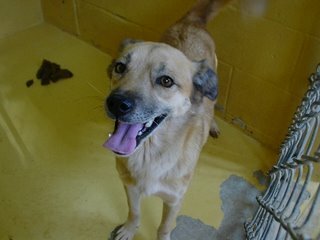 She is is a small girl, about 25 lbs and just about 2 years old. HER LAST DAY ALIVE WILL BE JANUARY 9. This big boy has a uniquely marked coat and has a stocky body. He is friendly and playful and looking for a home to call his own. HIS LAST DAY ALIVE WILL BE JANUARY 10. 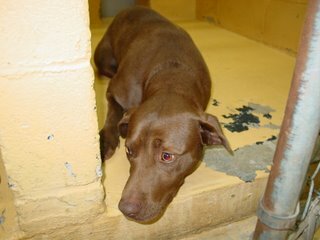 This 1 year old boy has a gorgeous copper coat and the sweetest hound-dog face...just says "take me home", doesn't it? HIS LAST DAY ALIVE WILL BE JANUARY 10. AO7-0015 REDBONE COONHOUND MIX-RESCUED! THANKS AAR! This handsome fellow appears to be around 5-6 years old. He has an irritated eye. He is also very skinny. 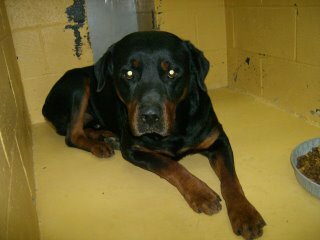 This guy needs someone who will love him and take care of him better than his previous owner did. HIS LAST DAY ALIVE WILL BE JANUARY 10. 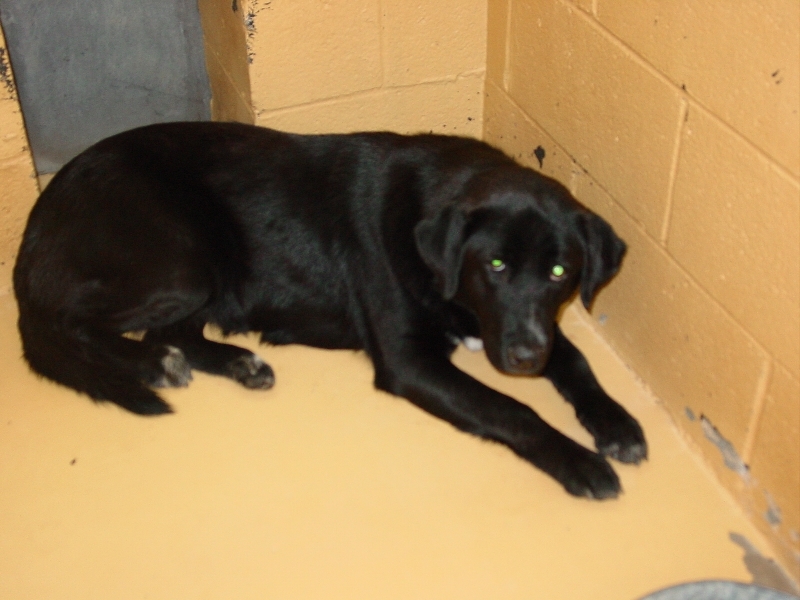 AO6-3527 HUSKY/LABRADOR MIX-GWEN-OWNER SURRENDER...RESCUE ONLY...PREGNANT-RESCUED!!! 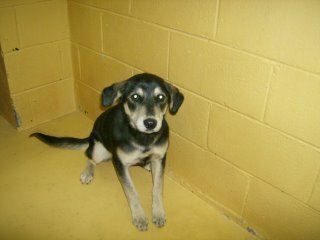 Dear Gwen was dumped at the shelter along with her sisters Gidget, Gale and Gypsy. She has beautiful blue eyes and a solid white coat. Gwen is very PREGNANT and could deliver any day now. Gwen is very reserved, not extremely affectionate, but tolerates handling well. 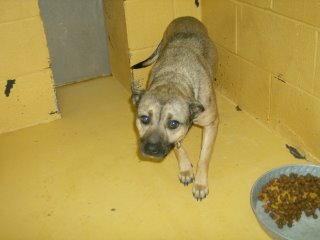 The shelter will ONLY RELEASE HER TO A LICENSED RESCUE GROUP. 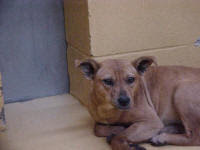 If not rescued, HER LAST DAY ALIVE WILL BE DECEMBER 14. 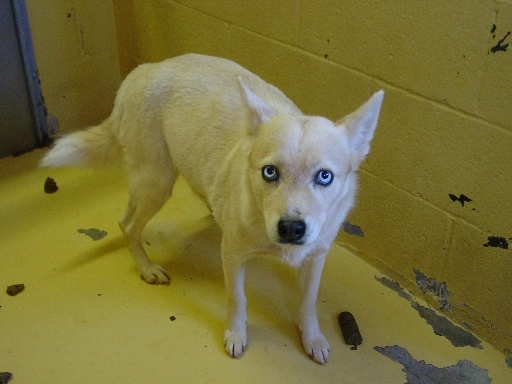 AO6-3527 HUSKY/LABRADOR MIX-GYPSY-OWNER SURRENDER...RESCUE ONLY...PREGNANT-RESCUED! Poor Gyspy! She was dumped at the shelter along with her sisters Gidget, Gale and Gwen. Gypsy is just 2 years old and is PREGNANT. She already has milk for her babies, so she is due any day now. She has a fabulous, outgoing personality. The shelter will ONLY RELEASE HER TO A LICENSED RESCUE GROUP. 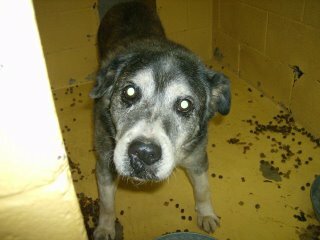 If not rescued, HER LAST DAY ALIVE WILL BE DECEMBER 14. 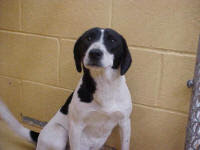 Gale was dumped at the shelter along with her sisters Gidget, Gwen and Gypsy. Gale is prematurely grey around her muzzle, but is only 2 years old. 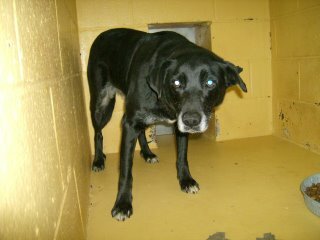 She is a shy girl who trembles and shakes in her kennel. HER LAST DAY ALIVE WILL BE DECEMBER 14. 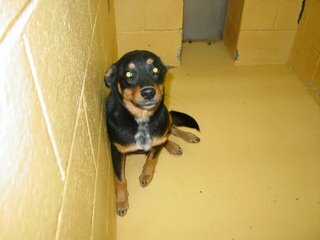 Gidget was dumped at the shelter along with her sisters, Gale, Gwen and Gypsy. 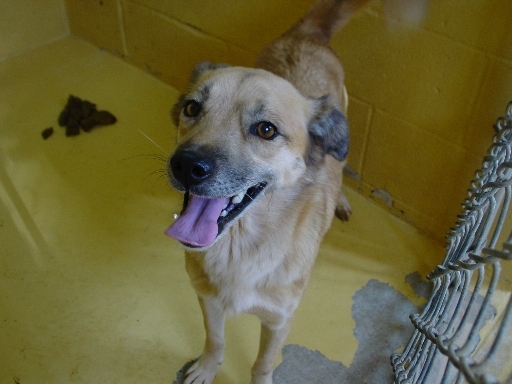 She has a nice, mellow temperament and a pretty honey-colored coat. HER LAST DAY ALIVE WILL BE DECEMBER 14. Well, they don't come much cuter than tiny little Grace. With her bristly coat and her endearing personality, I can't understand why she hasn't been adotpted yet..but she is in danger. HER LAST DAY ALIVE WILL BE DECEMBER 14. Cute little Princess really needs a home where she can truly BE a Princess! 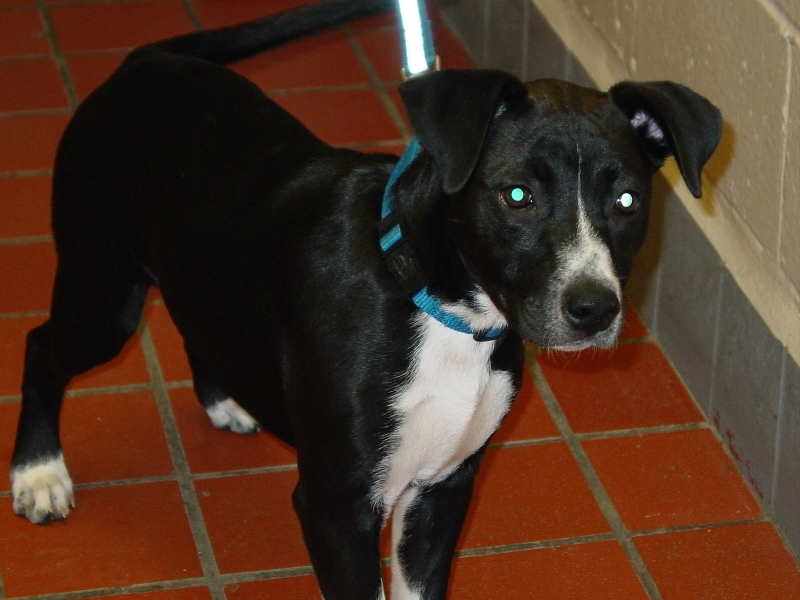 She is small (under 20 lbs) and has a pretty wiry black coat. HER LAST DAY ALIVE WILL BE DECEMBER 14. Handsome General appears to be a Cocker Spaniel with a long tail. He is very friendly and never meets a stranger...a really nice, stable temperament. HIS LAST DAY ALIVE WILL BE DECEMBER 15. 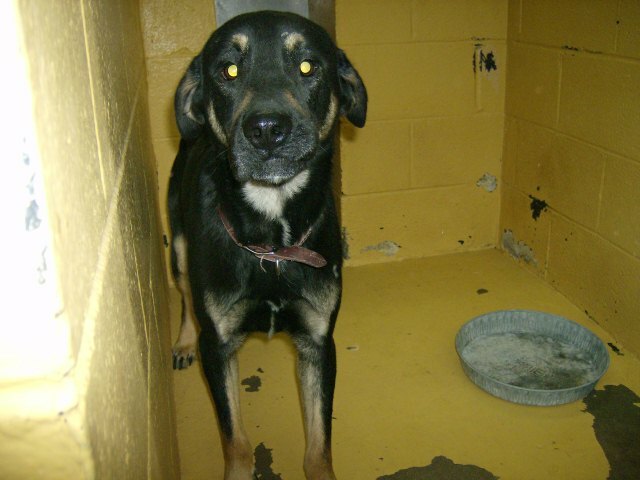 B06-779 SHEPHERD MIX-URGENT! NEEDS RESCUE! RESCUED! This big boy has a heart of gold, despite his broken hind leg. He must have been hit by a car before he came to the shelter. 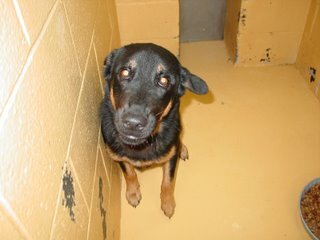 Since he is not showing signs of being in pain, the shelter has allowed him time to find rescue. His leg does not seem painful, but it is not weight-bearing and will not straighten out at all. HE NEEDS A LICENSED RESCUE TO SAVE HIM! HIS LAST DAY ALIVE WILL BE DECEMBER 17. Well, I think the shelter outdid itself coming up with horrid names this time! Such a silly name for such a nice dog. This boy has a sunny personality and is playful without being in your face. HIS LAST DAY ALIVE WILL BE DECEMBER 18. Golly is a sweet, humble little girl. She does not demand attention, but dearly loves for you to stop and talk with her..her tail wags constantly. HER LAST DAY ALIVE WILL BE DECEMBER 18. Dear Guy would dearly love to have a haircut! 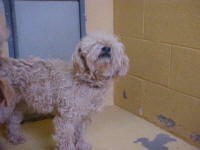 He can't even see due to the knotted hair in his eyes...he is matted all over! But his loving personality is intact..he is just waiting to shine! HIS LAST DAY ALIVE WILL BE DECEMBER 18. 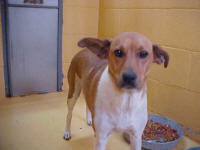 AO6-3534 JACK RUSSELL TERRIER/COLLIE MIX-GERTIE-OWNER SURRENDER-RESCUED! Gertie is a pretty girl sporting a smooth sable and white coat. She is very quiet and almost looks right through you with her pleading eyes..she wants out of her so badly, but isn't making a fuss about it. She is available NOW and HER LAST DAY ALIVE WILL BE DECEMBER 18. 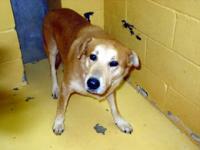 AO6-3552 LABRADOR RETRIEVER MIX-GILES-OWNER SURRENDER-RESCUED! Giles is here with his sister Gordo. He is much more laid back than his sister, but just as sweet and loving. A little shy, he warms up quickly. He is available NOW and HIS LAST DAY ALIVE WILL BE DECEMBER 18. Sweet, funny Gordo...such a pretty girl stuck with such an unflattering shelter name! But she doesn't let it get her down..this 6 month old girl has loads of energy and a fun-loving spirit. She is available NOW and her LAST DAY ALIVE WILL BE DECEMBER 18. 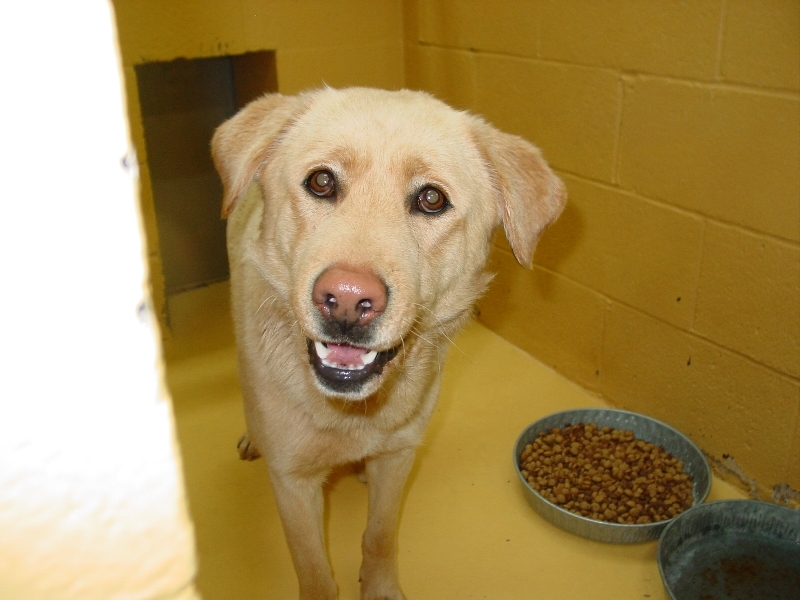 AO6-3415 YELLOW LABRADOR RETRIEVER MIX-CARMINE-RESCUED! THANKS, RITA! Carmine is a very sweet girl. She has a quiet, subtle way of getting your attention..she just wants a home where she can be a member of the family. 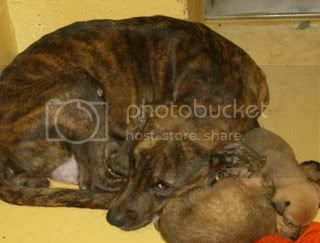 Carmine also has a 3 month old pup of hers at the shelter with her. THEIR LAST DAY ALIVE WILL BE DECEMBER 1. This is a bad pic of Chips. This one year old boy is all smiles and wiggles when you talk to him. He is always friendly to everyone and never meets a stranger. HIS LAST DAY ALIVE WILL BE DECEMBER 1.